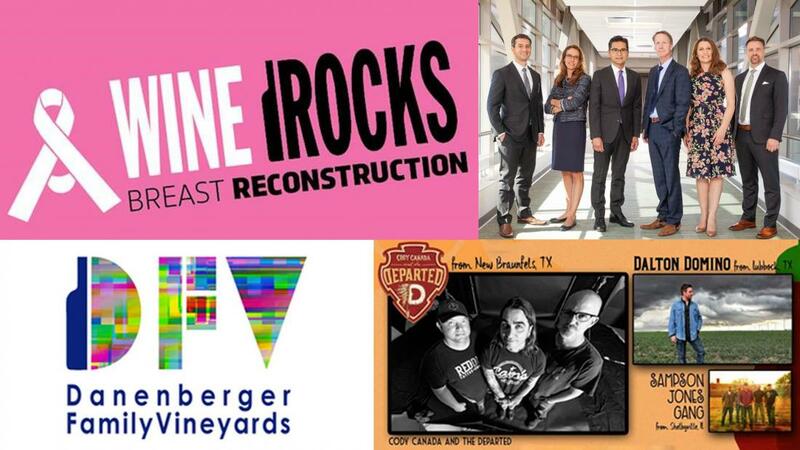 The Division of Plastic Surgery at Southern Illinois University Medicine has teamed up with Danenberger Family Vineyards to host “Wine Rocks & Breast Reconstruction,” 4-9 p.m., Saturday, Oct. 6, in support of The Plastic Surgery Foundation’s sixth annual Breast Reconstruction Awareness Day observance. BRA Day is designed to raise awareness regarding post-mastectomy breast cancer care. The event includes live music, a question and answer session with plastic surgeons from SIU Medicine and door prizes. The vineyard will also unveil a new interactive art exhibit by SIU Medicine chief resident plastic surgeon Amanda Ross, MD, and a raffle featuring a Danenberger Family Vineyard wine gift basket and gift certificates to the SIU Medicine Cosmetic Clinic, BJ Grand Salon and New Age Tattoos by Jason Lee. Danenberger Family Vineyards, located at 12341 Irish Rd. in New Berlin, will host a trio of bands, including Cody Canada and the Departed, Samson Jones Gang and Dalton Domino, as part of First Fridays Concert Weekend. Wristbands cost $12 and includes access to Friday, Saturday and Sunday concerts. For more information about the featured bands or to purchase a wristband, visit https://redbeardbrigade.brownpapertickets.com/. A limited number of wristbands are available. Breast Reconstruction Awareness Day is a collaboration between the American Society of Plastic Surgeons, The Plastic Surgery Foundation, breast centers, nurse navigators, corporate partners and breast cancer support groups. For more information about Wine Rocks and Breast Reconstruction, find the event on Facebook at https://www.facebook.com/events/294219614693459/. To learn about breast reconstruction options, visit www.BreastReconUSA.org. Created at SIU School of Medicine in 1973, the Springfield, Illinois, based institute has grown to include an outstanding team of physicians, a thriving residency and fellowship program, an excellent hand surgery and therapy center, and attractive facilities. The institute is known nationally and internationally for its work in many areas including microsurgery, hand surgery and therapy, reconstructive surgery, aesthetic surgery, and specialized care in the treatment of burns and problem wounds. The American Society of Plastic Surgeons (ASPS) is the largest plastic surgery specialty organization in the world. Founded in 1931, the society is composed of board-certified plastic surgeons that perform cosmetic and reconstructive surgery. The mission of ASPS is to advance quality care to plastic surgery patients by encouraging high standards of training, ethics, physician practice and research in plastic surgery. The Society advocates for patient safety, such as requiring its members to operate in accredited surgical facilities that have passed rigorous external review of equipment and staffing.